Bryan and I headed to the Florida Fairgrounds on a Sunday morning at the end of the week to peruse around. We saw beautiful photography and art. They were selling wine and breaking down agriculture booths. Bryan loves the animal exhibits and so do I. I own a Paso Fino gelding and loved to see the Paso show. They also had a drill team skill being judged. The photo below is Bryan being photo bombed by a goat. After the fair, Bryan and I too a walk later in our community. He rode in a cart and enjoyed every second of it. :) He was asked a few neighbors if they had chips for him. LOL Lucky for me, they just laughed and played along. What a fun day. When I think about the sacrifices made for my freedoms, I am grateful and humbled. Between Dave and I, we have a strong Navy background. Both of our grandfather's served in World War II. Dave's grandpa Richard Sampson served in Guam while my grandpa Walter Kisner served in Ijo Jima. My father Brian Kisner served in the Navy in the 70's in communications. Dave served on the USS George Washington CVN 73. I grew up knowing that my grandfather visited Hawaii during his deployment which made it seem like a fun thing to a child. He brought a grass skirt home for my grandma. Yet, he never spoke about his service and everyone knew not to ask (and I learned). He was elated when the World War II Memorial was constructed in Washington, DC. It validated his service in Ijo Jima. He saw the flag raised that fateful day and years later he started looking up his U-Boat members with pride. George Carlin made fun of our use of language and there is a clip of him talking about how we have to be politically correct when it comes to recognizing the trauma our service members return with from war yet the sacrifices are still the same no matter what war, battle or service our service members provided to our safety. Working for a Dept. of Defense contract phone line for active service members, I had the opportunity to be on the phone with active service members. War can cause many difficult nightmares and obvious symptoms that plague a person but there were other sacrifices that one would never think to attribute to active service. A mom who was a trauma nurse who worked in a front line base that was consistently attacked by IED was not traumatized over the loss she witnessed due her job. She was able to manage the carnage she witnessed with help from her fellow nurses and support from her commanding officer. Her difficulty was that her son had grown over an inch in the year that she was gone. She was plagued by the realization that she missed an entire year of his life that she would never get back and it caused her torture. There are thousands of subtle examples that are so personal to the service member. We often are able to quickly treat the outside wounds but the inside remains personal and insurmountable to some of our service members. Every day in the United States, the average number of military suicides is up to 22. We need to provide so much support to our service members returning from war. Thank you to all who have fought for our freedom. We honor you today and always. In our hearts and minds, your tremendous sacrifice both during your career and the scars that you bear on the outside and secret ones you carry deep within you are appreciated. Please if you know anyone who needs some one to talk to because the weight of their service is heavy on them; please contact the followi-ng lines: Military OneSource (active military): 800-342-9647 Use this website for Veterans: http://veteranscrisisline.net/ You can chat if you need too. 1-800-273-8255 is a crisis hotline for anyone experience struggle. We say thank you to ALL branches. They are ALL so important! We also include today our first responders who care for us at home including EMS, Fire fighters and Police Officers. I wish we had a day just for them because they come to our rescue while our military protects us on a daily basis. 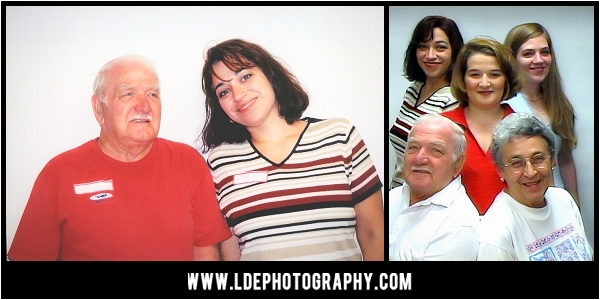 LDE Photography provides deeply discounted session fees for our service members active and retired. We also provide the same discount to our first responders. We are proud to be a photographer for a project that provides free photo sessions for deployed soldiers who's little ones are birthed while they are away!! Today is one year since he left us. I want to say left us because he was always walking at least 3 feet if not more ahead. I want to say left because he literally finished Thanksgiving dinner, arrived to his home and passed as if he planned it that way. A beautiful day with his family eating one of his favorite dinners made for a last day that was cherished. He completed his mission for the day, for the year and for his life. Walter Milton Kisner is my grandfather. This man LIVED his life. To the hilt. Everyday. Full pace. It was tough to keep up with him. His biggest frustration in his last year is that he couldn't get around like he wanted because of his knees. Walter rarely missed out on something that he wanted in life. He went for it. When we walked anywhere --he always walked ahead. He was on a mission. He had a purpose. We would walk in Wal-Mart some times and the door greeter would be greeted. Hi SAM!!! Like they were best buddies. Sam, the greeter would stare at Pap like he should know him but doesn't but smiles and says Hi back. He always would use people's first names no matter if they were a person he met, the president of my college or a life long friend. We saw him as a natural leader that stood up for what he believed was right. He didn't take the easy, quiet route in situations. He worked hard and gave to others. Walter Milton's military career was important to him but he saved the details for a quiet place in his mind. You could tell he was drifting off in thought but he would dismiss if you if you directly requested details. He would put his head down and walk away sometimes. He served on a U-Boat in WWII in The Battle of Iwo Jima. The best thing this country did was create the Memorial in Washington DC. The Memorial finally honored him and that is when he finally started being super proud of his service in the US Navy. He loved America and he and Gram toured the USA. Pap visited all 50 states. He had a disdain for politics and if you wanted him wound up just mention the President. Tirade!! He worked Kisner's Cider Press for years. He believed in community. He served for years as a member of the Grange. He also volunteered for hours in the warehouse in Uninotown, PA. He attended his church faithfully and prayed for all of us. When he did stop for a break now and again, he called it "taking 15." This meant he was actually going to stop for 15 minutes and then boom -he would be back up and into something again. We always had some inside joke going. He was constantly teasing me about something. I was due to have my baby on May 8 but He kept teasing me about holding out another month to have Bryan my son on his birthday. He wasn't afraid to try new things. I remember when he got a DVD player and he asked me how to use it. It took me awhile to convince him he no longer had to rewind rental DVDs like video tapes. One accolade many might not be aware of but he was the Fayette county fairs sexiest senior legs two years running. He enjoyed just sitting on the porch. When I was little we watched hours of Price is Right and Road Runner. We would set up tray tables in the living room and he taught me how to eat sardines with saltines and mustard. Every year no matter where I was I would call pap right at New Years. Even Jan 2012. It was our tradition. We put a penny in our pockets, ate potatoes (Irish) and Kolbosi and Sauerkraut (German) every New Years. My grandfather never underestimated me. In fact, I honestly believe he pushed me  to do more. I could call and say Grandfather I'm headed to the moon and he would say "GO FOR IT HONEY." He called me Little One but he never made me feel little. He let me work in the Cider Press growing up and taught us the value of money. One summer, he and I put the roof on our house. I learned how to shingle. He didn't care that I was young or  a girl. He gave me a hammer and showed me how to lay the shingles and how to hit the nails correctly. When I did pursue something, he supported me through it. He would ask questions on how things were going and when I did make an achievement, both he and Gram were there to support me. They were there for EVERY graduation!! They visited horse shows, recitals, and a buckwheat pancake dinner because I was serving to name a few. You name it and he was there to support you. He often told me he was proud of me. He was very direct about what he was feeling. He didn't mince words. You knew when he had something on his mind. He would take you aside and say honey help me understand what is happening. He approached you from a place of love and respect even as he told you he thought you may be dead wrong. If you made a mistake, he would say that's alright. Let's get going and he'd be ahead 3 feet trucking onto the next project. He never stopped moving. He always pushed me to be healthy. To eat better and to take care of my body. He and Gram walked every day that they could. They had bikes for a long time and would motor around Daytona. He was married to Gram for 67 years. They were partners in every sense of the word. They had a beautiful routine/rhythm to their lives. You could guess where they would be and even what they would be eating!! They really enjoyed every member of their family. There was one point they lived with me for awhile. It was wonderful. I miss being able to chat with them each week. I wasn't going to bring the camera to Thanksgiving dinner last year but I am so glad that I did bring it. Who knew it would be the last moments? This photo below really gives me peace about him leaving. The looks between my son and my grandfather as if they know something we don't in a way. I'm so happy that Bryan will have a photo with his Great-Grand Father. I'm even more grateful for all of his influence and love I got to experience as his grand-daughter. His very last words to me were that I should take good care of Bryan. His voice still echoes in my ear. Lorie's story is incredible. Even more inspirational is how her family, friends, neighbors and community have joined to support this family and Lorie's recovery. The full story is told better through her families postings and if you want to support, learn and be a part of Team Lorie, you can visit the link here: http://teamlorie.webs.com/ or join the facebook page: https://www.facebook.com/pageteamlorie On a Saturday a few weeks ago, we took the buggies out for a scrubbin' in the name of a great cause. Bryan met a new little person who he enjoyed spending time with at the car wash. We keep this family in our prayers. The Scottish call it the gloaming. I call it my absolute favorite time of day. The moment right before the sun dips into the ocean and takes leave of his duties on this side of the planet. It's magical to me and a good sunset relaxes me for some reason. Dave and I get so busy going with all of our extra curricular activities, managing a household, a business and of course being managed by our 17 month old that every once in awhile, I have to shake it up a little. We had publix subs. About to digress into a manifesto and on the wonders of a publix sub but just try one and you will never go back to the other joints again. Subs and chippies and drinks at a picnic table at Apollo Beach. Actually, we were heading down to E. G. Simmons but they were closed so we jetted back up to Apollo just in time to eat and experience the sunset. Bryan loved running around and I"m visioning some one's holiday photo session getting done there right at sunset. :) ENJOY!! The big question heading out on this trip was would he be frightened by Mickey or would he run up and embrace the character. On Facebook, people were making guesses on his reaction. We met up with my sister Garnett and my nephews Zach and Joel. My brother Jeff was visiting Magic Kingdom for the first time from Pennsylvania. It was a perfect day to capture some family portraits while at Disney. It is a great way to commemorate a time when your family is relaxed, enjoying themselves and at a perfect location. Disney is a great place to capture some portraits. There are ops every where - especially in the Magic Kingdom Resort. Vacation portraits just make sense for families because you have the time to think about the portraits and it is easier at a beautiful location such as Disney resorts. After Bryan was finished with being in his stroller, we headed over to Downtown Disney to play in the fountains. What a hoot. Bryan broke out in dance, yelled at the water because it was moving away from him and really enjoyed the other children running around. He is a little character out there. Dave took patrol so that I could capture out little guy having fun in the sun. WE love the Bartlett family. This week I called Melissa. Actually, Dave called Melissa while I held my feverish boy and asked her advice. We love the way this family is so kind, well cared for, healthy and loving. A few weeks ago, Paige skated at Ellenton,FL (yes, ice rinks in Florida but they are everywhere!!) And she skates so passionately that Paige shares her love for the ice with her dance. She doesn't just do the moves, she moves the audience. OF course, I had to take the camera while she skated. I studied ice rink photography settings because there are many things working against a great image. 1. Distance - I used my 300 to get up close. 2. Lighting -- fluorescent tones the skin green (lovely) so white balance is key 3. SPEED!! They are MOVING in a dark ring yards away. If the settings are not correct, you end up with blur. yuck. I just upgraded to Lightroom and of course, used some presets from Munchkins and Mohawks (a Pittsburgh company!) ..
and maybe some day you will think as you watch the a skater on the ice .. I know that girl from some where!! If you ever get a chance to visit, please take the time. Orange Lake Resort has a lazy river. It is a fantastic invention. You get in an inner tube and the pool takes you around in a large circle. The resort is close to Disney (You can hear the Lion's roar from certain parts of the property.) They have golf, food and even more pools. :) Dave, Bryan and I took a day to hang out with Ron & Danyle who visited us from Pennsylvania. Danyle and I became close after I moved back to PA after college. She's been a wonderful friend, support and cheerleader for me. We always have fun no matter what we are up to and it was fantastic to see her. She came down just to meet Bryan and that means so much to both Dave & I.
Garnett (my sister) and I headed to the Glazer Children's Museum in Tampa, FL. It was busy but awesome!! Bryan was so sleepy by the end because he honestly played until he dropped!! The learning is experiential and children get to interact with some many different areas from water, dexterity, flying planes and boat, dancing, interacting with leggos, play kitchens, fire house and a vet area. We did not stop at all of the possibilities because he was literally ready for a nap before we finished up. FUN!! We visited the Lowry Park Zoo. It was so Florida hot so the animals were napping peacefully. Animals are so beautiful to me. The zoo was fantastic. Beautiful habitats with well cared for animals was wonderful to see. I'm really proud of the bald Eagle photos because he or she is unable to fly now but is helping children and families remember our national bird. Brand new baby elephant hanging out with mom. The baby got to go in early and followed mom back into the barn. It was adorable. At the Lowry Park Zoo there is a water area that Bryan really enjoyed. :) It took him a few minutes to get excited about the water and all of the other children running around. Once he got into it, we had a blast. He broke into dance. He enjoyed the water. Is amazing every day. And he reminds me with simple fun. He gives me the opportunity to be 16 months again. To see things through his eyes. To be in CONSTANT motion and to see life for the first time. Yesterday, he touched my coffee cup on the bottom and said the word HOT. I'm amazed. Last year, we were excited for him to roll over. Now, my little man is capable of so much and everyday is learning something new. Photography of people was not my first passion. I was happy photographing meadows, waterfalls, trees and horses. It was my coping for when I had a bad day. I would take the camera out for a walk. I did not know much about settings like aperture, iso or shutter speed. I used the landscape button and hoped for a good exposure. Photographing people is much more dynamic in some aspects. I'm still a huge National Geographic and HDR *high dynamic range* landscape fan. If you get a moment, one of my favorite locals is Bob Salyers. He does photography adventures. I promise myself one day soon I will book my adventure for the fun of it. I really enjoy his large canvas art work. You should see it in person and his type of photography is challenging. Keep in mind the gorgeous eagles, heron, spoonbills and other wildlife do not call or text to say how awful they think they look in the photographs. :) People are so critical of themselves. We are beautiful, unique and fluffy in some spots where we would not like to be at times. Remember when you were little and how you looked did not matter so much?? You were able to laugh and enjoy life around you. I would encourage you to remember that no matter what size you are or what feature you dislike; your heart is what you will be remembered for and that is what people will recall when they see your photograph. How you made them feel. Keep that in mind and you will always be beautiful. You have my permission to be 16 months again and run wild and free!! Here is some inspiration!! ENJOY!! Okay. So I did not get ONE photo of the actual dolphin. In my defense, I was baby wrangling the ever curious 14 month old and maybe it is my social worker roots but I'm kinda overzealous about monitoring his every interaction in public. Bryan is the most important person ever in the whole wide world and I"m his personal security guard caretaker. So no dolphin photos. :) However, I will take this opportunity to show off some of my MANUAL photography skills. NO FLASH folks. I did not use flash AT ALL in the dark fishy tunnel of the attraction. :) HOW did I capture those photos without any blur?? practice, practice, practice. This photo was captured while my sister drives whatever the speed limit is over the Courtney Campbell Causeway to the Winter the Dolphin attraction. :) The bird is very far away and we are travel very fast. My 300 mm was able to capture him at very fast speeds!! I have always wanted to snag a panorama of Clearwater coming over the bridge. Garnett has TINTING on her windows so the colors changed. I really need to be in one of those Volkswagen vans (but I wouldn't be safety strapped) but you know what I mean?? It takes my breath away --- EVERY TIME! This photo below makes me sing the fish heads song. They are posing very artistically don't you think?? My sister Garnett, soaks up the love of Bryan but he seems a bit distracted. He loves FISHIES!!! NO FLASH!!! There was NO FLASH used to capture these photos. Did I say the phrase no flash enough times?? Well, because it is a skill necessary for capturing weddings in dark churches with NO FLASH photography permitted. And if I can capture the boys with this lighting in this venue (surrounded by tons of tourists on a Sunday) can you image what I could capture at a wedding venue?? Me being ... ARTSY again. Can you see me in the glasses?? The stroller is Bryan's. Remind me to NOT bring the big stroller next time to such a crowded venue full of STAIRS?? One of Bryan's birthday presents was a bubble machine. I know I'm more excited that he was to play with it but he certainly caught on quick with the help of my nephews. Remember these days? One of my favorite things about being a mom is reliving the fun times. Had I been single and on my lonesome with no child; I never would have had an excuse to break out the bubbles. ENJOY!! I mean it... please ENJOY! Last week, we took Bryan out out to the aquarium. He loves the fishies and he screams in delight. I love taking the camera to the aquarium but chasing Bryan is full time and not much time to mess around with aperture! :) On Sunday, he was super active as we played so I decided to capture a few of those moments. He's growing and changing so quick and it is amazing to look back on the shots and see this person developing more and more and more and more ... with each passing day he learns some thing new. Capture it now. His new smiles, sounds and habits because they will change in the next 6 weeks and the next to the next .. ENJOY!! LDE Larissa & David Ensign .. and we have the bestest little boy ever. The first year has been undeniably amazing. I wanted to take a photo each week. With my Iphone, I average 5 a day. He just does so many fabulous and amazing things. And as his mother, I'm astounded at his development. He was so tiny and vulnerable. He learns fast and is already independent, decisive and curious. He is such a sweetie with a happy little face. We held his birthday party at the Hillsborough River Park. If you ever get a chance to visit the park, it is wonderful. We ran into a huge alligator sunning himself ACROSS the bank. We enjoyed a few friends and family members. The park has wonderful trails and beautiful rivers full of natural wonder. Okay .. so I'm seriously behind in posting because taking photographs and editing has been really taking up a great chunk of April. Or I can blame it on turning older. I stopped to celebrate. Ah! I'm 39. (panic) ... hehe.. Dave and I have spent time tweaking services, costs, presentation and have done a few consultations to improve our growing business. We have been creating marketing materials, debating freebies and looking into how to keep ourselves fresh and unique for our customers. In the mean time, we took Bryan to Epcot to enjoy the flowers and yeah, I took 300 and I would have taken a billion more but we ate, enjoyed the sites and ate some more. I love going to Epcot with Dave. It's relaxing and interesting as he knows a lot of personal history from working there. It would great do some wedding photography in Orlando during Flower and Garden some day. The first surprise I ever purchased for my husband Dave when we were dating was tickets to a Yankees game. He loves baseball. He makes the calls before the announcers say the exact same phrases. He knows the players, the game and the history behind it. For Dave's birthday this year, we took a trip to Sarasota to see a college baseball game. It was important for us because it was Bryan's first ball game ever! (Dave says he's already been to a game but technically he was not born yet so I do not count it.) :) The college game was played at the same field where the Orioles have spring training. We got to see them because they took a little extra time on the field. The colleges were a local Florida team against ... Notre Dame. One of Dave's friends, Chuck Ristano is the pitching coach for the team. The first baseman is Trey Mancini. His father is Dr. Mancini who delivered Bryan!! We had the fortune to catch up with both which made the game even more special for us. It was so cold and windy that it was best to leave a lot sooner than we really wanted to but we didn't want Bryan catching a cold. We are already excited to plan our next trip. Dave took most of the shots because I was taking care of baby Bryan. He's getting pretty handy with the camera because he took a wonderful shot of Bryan and I together.